One of the reasons I love blogger platform is the ability to add alot of beautiful features without much stress. One of this feature is the Disqus Comment system. Disqus is one of the best anti-spam comment system out there and the wonderful thing is that this service is free. I know many newbie bloggers don't want to spend cash on there blog until they are earning so cool cash from it. Today, I will be dropping a tutorial on how to add Disqus comment to a blogger blog. This will also add beauty to your blog and it will look much professional as well. Good news, Disqus is mobile responsive, anti-spam protection and comes with a a stunning design that will take your breathe away. Follow me as I drop a step by step detailed guide on how to install Disqus on your blogger blog. How to Install Disqus Comment on Blogger. 1- Go to Disqus and sign up for an account. There are ways of signing up, like using your social profile, this includes (Facebook, Twitter and Google Plus) or using your email. I prefer you use your email to sign up. After that, input Your Name, Email address and Password then click sign up. Now rush to your mail and Verify your account. 2- Quickly go to settings, Admin Page, input your Blog Name, your unique Disqus URL and blogger category. In the screenshot below I select Tech as my category, so show according to the category of your blog. 3- Now that we are done with the sign-up, it's time to install Disqus in the blog. You will be transferred to the installation page where you will have to choose your platform . As far as this tutorial is concerned we are focused on Blogger, then we select Blogger platform. 4- After selecting Blogger as platform, then installation instruction page will appear. Now click Add Fixmansion to my Blogger site. 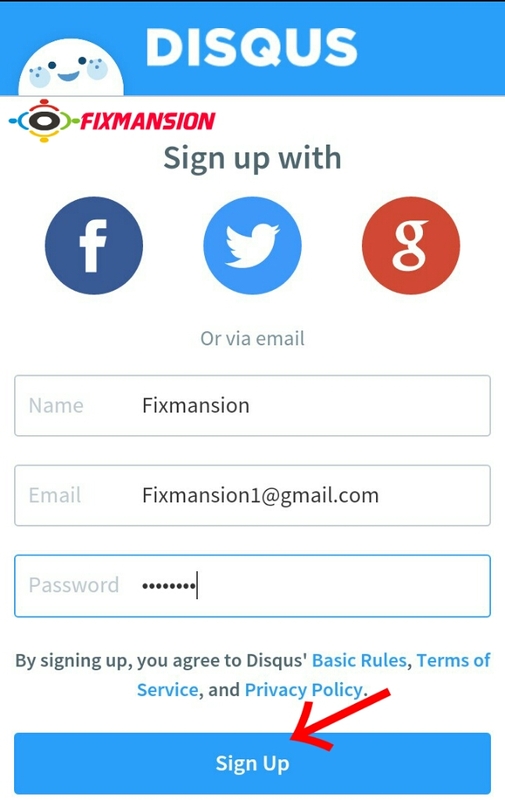 Where Fixmansion is my Disqus name. 5- A new window will open with the Add a gadget menu. Select the blog that you want to add this comment system and click Add Widget. You’ll be redirected to Bloggers Layout page where you’ll see the new gadget (never remove this widget), click Save layout. That's it guys, reload your blog and see Disqus up and running.